Friday 30 November, Veta Records opens the doors on its first live music night in Berlin at Neukölln’s Loophole. 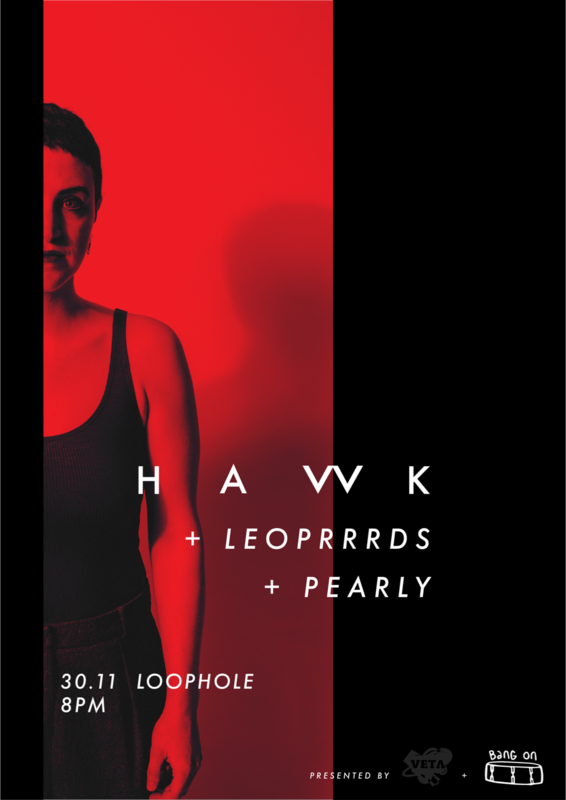 Three Bang On alumni join the bill: HAVVK, Pearly and Leoprrrds. At the helm of Veta Records and the night is Julie Hough of SelfMade and grunge-rockers, HAVVK, who we catch up with ahead of the show. Musician and event all-rounder, Julie Hough heads-up three projects that span between Ireland, the UK and Berlin. Bang On Team: Spanning a couple of countries, and with a live and recording component, Veta Records is a bit of an industry hydra. What else do people need to know about Veta? Julie: We’re an indie label working with bands we love. It started out because our co-founder, Matt had begun some production work with artists in London and naturally, when it came to them releasing their music, we wanted to help – mostly so they didn’t make the same mistakes we had as artists. The more engaged we became with the creation side of the artists’ work, the more we wanted to offer a kind of three-sixty support system to help them develop. We work really closely with artists to give them the best chance at putting their music out there. The collaboration depends on the artist, but usually it’s a combination of production, artist development, and strategy, always with the aim of empowering the artist to handle the day-to-day DIY elements of music that can be super time-consuming and stressful. The live leg of things is really exciting. For us, it’s a chance to celebrate artists we love, and connect them with new fans and communities. We’ve got roots in Ireland, the UK, and now Berlin, so we’re hoping the live side of things will be a way to cross-connect these scenes. We see the live component as an important way to redress the imbalance of representation in music. The large majority of Veta artists are women, and we want that to be a statement to each person who comes to a Veta show. BOT: What's Veta Records' raison d'être? J: There’s a huge gap between artists and the perceived ‘industry’ these days. But we don’t want that to be a reason that great music doesn’t find its away on to stages and playlists. Everything we do comes from a place of empowering artists, so that the ‘untouchable’ illusion of the industry doesn’t overtake the fact that there are listeners out there, ready to support them. BOT: Why's it so important to foster DIY music communities? J: We really believe that space can be taken up by artists, redefining what they want their scene to look like. But it only happens when enough artists take steps towards it, and that requires community and support. Competition will always exist in music, but it can’t be the crux of things if we want to be part of a healthy scene. BOT: How's it been bringing the project to Berlin? J: Exciting and a little all over the place! We put our live nights in London on hold for a while, but in its place we started working with loads of new artists and developing our (HAVVK’s) debut album too. It was worth it; to take the time to do more ground work behind the scenes. Now, it really feels like 2019 is going to be the time we go super visible with Veta. There are some new artists on the roster that we’ll announce in the new year, and we’re planning a bunch more co-promotions around Germany, Ireland and the UK, to connect with more local scenes. BOT: 30 November, you'll launch Veta Records Night in Loophole, Berlin. What can people look forward to? J: The first Veta night is also the launch party for HAVVK’s next single, so we’re hoping it’ll be a bit of party all-round, but it’ll come with a balance of our own stage giddiness and making sure things run smoothly. We can’t wait to play some material from the new album. We’re playing with two of our favourite local acts too, Leoprrrds and Pearly, another Irish ex-pat band! Expect a lot of grungy vibes and potentially some sweat. Julie’s project SelfMade promotes skill-sharing between artists. BOT: You're also a bit of a hydra in the music scene, Julie. What else do you have going on? J: I’m also running a project called SelfMade which kicked off at the beginning of this year. We’re an event platform that facilitates discussion about the real, day-to-day challenges of making music, and celebrating the skills that a lot of artists feel they can’t disclose on social media; the skills of managing a project. Myself and co-founder, Joanna, really believe that one major route towards a healthier music scene is to take away some of the stigma behind skill-sharing and asking questions. We do this through discussion, performance, zines and art. We’re so excited to start planning for 2019. There’s clearly a hunger for more safe spaces for artists to get together and discuss challenges away from the lens of social media or self-promotion. BOT: What's the last song you played on Spotify? BOT: Dream guest you'd like to walk through the doors on 30 November? Learn more about Veta Nights on the Facebook event page.